Recently I was teaching our college and young adults at church and we were studying the topic of spiritual growth...especially regarding quiet times and spiritual growth resources. I did something unique in that I had them each draw a number and the number they drew was keyed to a spiritual growth resource I had brought along to the class. They each grabbed their resource and I gave them approximately 5 minutes to look it over long enough to tell the entire class about the resource, its value, etc. Some people have asked me to go ahead and list those resources I brought with me that day. Here they are in a four-part installment. Also, these make great Christmas gifts since many of them are "Through the Year Devotionals" and Christians young and old might be making New Year's Resolutions. Remember these are just a few resources (the possibilities are endless, so this list is by no means exhaustive) that someone could use during his or her devotional time. Also, let me say that while these resources may be helpful in cultivating a devotional life, there's still no substitute however for simply going straight to your Bible during your devotional time. So here you go....the first of four posts of spiritual growth resources. This resource has a one page devotional for every day of the year. On each day of the year, you'll read a stirring story about a character or event in church history. It is particularly interesting because in each devotional, the dates of the devotionals correspond to the dates in the story. In other words, each day you'll read about something in church history that occurred ON THAT VERY DATE. This resource is amazing because it is a sort of "Christian Worldview" devotional. The devotionals come from Christian academics from a wide array of fields...art, history, science, bible and theology, philosophy, economics, etc. This makes a great devotional for the Christian who enjoys using their mind and who realizes the very important reality: that all of our life belongs to God and relates to Him rather than just the church time, devotional time, prayer time, etc. Truth and Beauty...wherever they can be found (in science, in sociology, in literature, etc.) belong to God and have their source, origin, root, their context, and their truest meaning when they are seen in reference to Him. This daily devotional offers reflections on passages from Genesis though Revelation. The author (John Stott) is one of the most internationally acclaimed Christian pastors and scholars. The great thing about this devotional is that it takes you through the entire Bible and help you connect both the details of the events with the broader story as a whole. You get the Bible's "big picture" and larger theological concepts and themes WHILE you go through each individual book. A gem if I might say so myself. Some say this book is "like Screwtape Letters in reverse". Imagine that you had a sort of older and wiser Christian who had a wealth of theological expertise, a wealth of pastoring insight, etc. to walk you through your experiences in the Christian life. All you had to do was write. That's the sort of relationship that sparked this book. The book consists of letters that were sent from a "senior saint" to a 'junior saint"...about all sorts of topics that the Christian might face...conversion, trusting Christ, temptations, the Christian and psychology, sharing one's faith with others, discerning God's will, etc. This is an especially nice read for someone either in ministry or studying for it. Revised edition of this collection of readings from devotional writers throughout the church ages. This volume includes excerpts from writers such as Augustine, Francis of Assisi, Julian of Norwich, Thomas a Kempis, Martin Luther, John Calvin, Evelyn Underhill, and Dietrich Bonhoeffer. For each reading there are reflections, questions for discussion, and bibliographies for further reading. This resource (like the last one) puts together writings from some of the brightest men and women of the Christian tradition. St. Augustine, Thomas Merton, Fredrick Buechner, A.W. 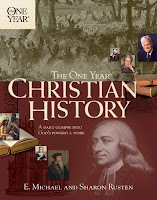 Tozer, G.K. Chesterton, Thomas More, Martin Luther King, Jr., Amy Carmichael, Simone Weil, Pierre Teilhard de Chardin, Hildegard of Bingen, John Milton, Dorothy Day, Leo Tolstoy, Gerard Manley Hopkins, and more...From nearly two thousand years of Christian writing comes fifty-two selections complete with a profile of each author, guided meditations for group and individual use, and reflections containing questions and exercises. Editors Richard Foster and Emilie Griffith offer their expertise by selecting inspirational writings and including their own commentary and recommendations for further guided reading and exploration. Stay tuned for the rest!!! This entry was posted on 7/23/2009 and is filed under Discipleship , Growing , Resources , Where Do I Start? . You can follow any responses to this entry through the RSS 2.0 feed. You can leave a response, or trackback from your own site.